How many "how to hold a meeting" guides are there? More than enough! 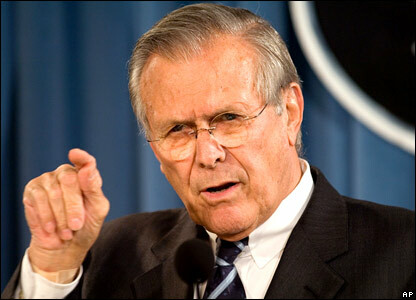 So it caught my eye that no less an eminence than Donald Rumsfeld is giving his ideas on how to hold a meeting. He's on slide 8 of Bloomberg Businessweek's How To issue for September 2011. He has four points, and three of the four are mundane: start on time/end on time, speak without jargon, and be inclusive (more on this later). But he has one point that seems less obvious: no matter the subject, start with assumptions. Why? Well, according to Don (can I address him as Don?) assumptions let's everyone know if they are likely to be in agreement with the topic. If so, it shortcuts the discussion of the unncessary so that the presenter can move directly to the punch line. Perhaps so. I'll be giving it a try. On the other thing, being inclusive: not in Rumsfeld's written missive, but attributed to him by those in the know (as heard on "Morning Joe" on MSNBC), Rumy would often 'dis-invite' those that he knew did not speak up, did not offer critical thinking, and thus were unlikely to add value. So, inclusive yes; but only if likely to add something to the discussion. At the risk of group-think, which is not necessarily implied, I like this one also. While mundane, failure to adhere to the first and third are common in the undisciplined world. I can't tell you how many times internal and external meetings start 5 to 10 minutes late, and yammer on "never landing the plane" as my wife says. Glen: although mundane, start on time is my pet peeve!